Having trouble finding a FODMAP friendly barbecue recipe? Most BBQ rubs and sauces have high FODMAP ingredients. So, you may have given up all hope of having BBQ this summer. But you’re in luck, my friend. 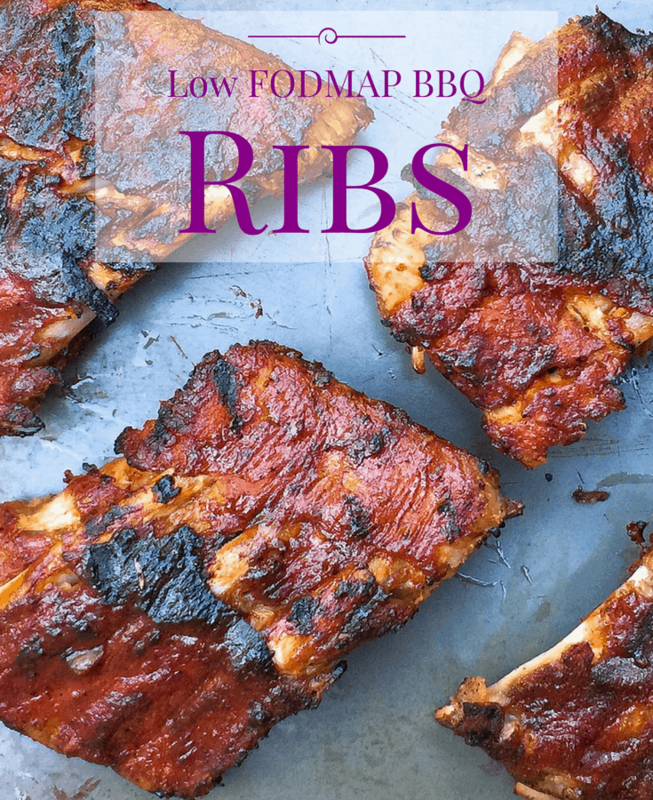 Check out these low FODMAP BBQ ribs. I started the low FODMAP program in the middle of the summer and it really put a kink in my BBQ plans. It took me almost a year to figure out a low FODMAP BBQ sauce, but man was it worth it! These fall off the bone ribs are the perfect combination of sweet and spice. They’re so delicious, no one will guess they’re low FODMAP. In fact, this recipe has been stolen by a ton of my non-FODMAP friends. I don’t blame them. It’s pretty spectacular. Think these low FODMAP BBQ ribs sound great, but you don’t have time to try them now? Don’t forget to PIN THIS POST for later. These low FODMAP BBQ ribs will be the highlight of your summer. Check out the notes below for tips on keeping this recipe FODMAP friendly. First, since meat is a protein, it doesn’t have any FODMAPs. However, you still need to think about your food volume. Too much food in your gut can put a lot of pressure on your digestive system. This can trigger symptoms no matter what you eat. Some people are also triggered by fat. While a little fat can make the sweetness of this BBQ sauce sing, too much can trigger your IBS symptoms. If you know fatty foods bother you, trim off some of the fat and watch your portion size. This dry rub is made with low FODMAP ingredients. So, it won’t add any FODMAPs to your meal. For the best result, make sure your spices are fresh. If you can’t remember when you bought them, replace them before you start. You’ll thank me later. There are a ton of ingredients in this BBQ sauce. Most of them are low FODMAP, but there are still a few things to keep in mind. Ketchup: Ketchup is a tricky one. Look for a brand without High Fructose Corn Syrup (HFCS) or garlic/onion powder. Garlic and onion can also be listed as “spices” or “natural flavours.” If you can’t find one at your local store, you can order a FODMAP-friendly ketchup from Fody Foods Co.
Beer: According to Monash University, beer is safe in servings of 375 ml (one can). This recipe uses 1/2 a cup of beer, which works out to 1.3 tbsp per serving. This is within the suggested range. If you’re sensitive to alcohol, don’t worry. Alcohol evaporates when it’s simmered for 20-30 seconds. You can use non-alcoholic beer if you want to be safe, but it’s not necessary. Remember, if you or a family member suffer from celiac disease, you need to use a gluten-free beer. You can find some gluten-free brands here. Do not use cider! Apples are high FODMAP, so cider isn’t appropriate during the elimination phase. Cola: Most colas in Canada and the US use High Fructose Corn Syrup (HFCS). I tried swapping the cola for diet coke and it was not the same. Now I use PC cane sugar cola, and the world tastes right again. If you’re not in Canada, check your local farmer’s market for organic or small batch colas that use real sugar. Molasses: According to the Monash app, 1 tsp of molasses is low FODMAP. We use 1/8 of a cup for 2 racks of ribs. This works out to 6 tsp for the whole recipe or 3 tsp per rack. So, as long as you stick to 1/3 of a rack you’ll be fine. If you know you don’t react well to molasses, or if want more than 1/3 of a rack, you can use low FODMAP cane sugar syrup. You can grab my recipe here. Heads up, if you’re swapping in cane sugar syrup, make the BBQ sauce the night before. The syrup has a lighter taste, so, your ingredients will need more time to mingle. It will end up tasting the same, the flavour just needs more time to mature. While it is my dream to one day power through an entire rack of ribs on my own, these days I still need some options on the side. When I eat BBQ, I tend to go all in. So, I normally pair my ribs with freshly made coleslaw, BBQ vegetables, sweet potato fries, or roasted or mashed potatoes. Have another suggestion? Let me know in the comments below. 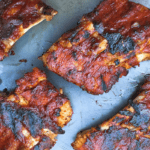 Want to try these low FODMAP BBQ ribs? Don’t forget to PIN THIS RECIPE for later. These fall off the bone ribs are the perfect combination of sweet and spice. Seasoned with a FODMAP friendly dry rub and then coated with a delicious low FODMAP BBQ sauce, this recipe is a winner! Prepare the dry rub by mixing all of your ingredients in a medium-sized bowl. Set aside. Lay the ribs bones up on a dishwasher-safe cutting board or a surface you can sanitize. Remove the membrane by picking it up from one end of the rack (I prefer the smaller end) and lifting it in an upward motion. The membrane often comes off in one piece, so work it slowly down the rack until you reach the other end. Discard the membrane when finished. Take your dry rub and massage it into the meat. Remember to rub both sides of the rack. Go slowly and make sure you cover each rack evenly. Then wrap the ribs in plastic wrap and place them in the fridge for 8 to 24 hours. This will allow the rub to settle into the meat and create the base for our mouthwatering low FODMAP BBQ sauce. To make the BBQ sauce, place a medium-sized saucepan over low heat and add all of the ingredients one at a time. Stir after each addition to blend the flavours together. Once all of the ingredients have been added, switch to high heat and whisk the sauce until it boils. Then remove the sauce from heat and let it cool. If you're using molasses for this recipe, your BBQ sauce will need about 2-4 hours to reach the proper flavour. If you're using cane sugar syrup, it will take 8-24 hours to reach full flavour. Preheat your BBQ to 300 degrees. Remove your ribs from the plastic wrap and cover them with foil. I prefer putting one layer on the counter, putting the ribs down and then placing a second layer of foil on top. I then fold the top and bottom layers together around the ribs. The idea is to seal the ribs in so they don't lose any moisture. Place your ribs bone side up on your BBQ and cook for 2-2.5 hours. You'll know they're ready when the meat starts pulling away from the bones. Try not to peek until at least the 2-hour mark or you risk ripping the foil and letting out the moisture. Once your ribs are cooked, turn the heat up to about 450 degrees. Remove the ribs from the foil and cover both sides of each rack with BBQ sauce. Cook for an additional 20 minutes to caramelize the sugar in the sauce. Turn them about every 5 minutes so they don't burn. Serve immediately! If you don't have a pestle and mortar to crush your rosemary, use the bottom of a glass or a bowl to break them down. These low FODMAP BBQ ribs will be the highlight of your summer. If you like this recipe, subscribe to my mailing list below. You’ll get new articles and recipes delivered right to your inbox. How well would this BBQ sauce keep if I wanted to, say, store some in the fridge? And what would be the best container for that (glass bottle, tupperware, mason jar, etc.)? Great question, Jess! I generally use a mason jar to store leftover sauce, though any airtight container would do. Since there is a lot of sugar in there and no preservatives, I generally keep it for about 3 days. You could try freezing it as well if you want to have it on hand long term. Oh wow, this really seems a great idea , though I’m a vegan not sure how to go for it but my other friends will go crazy on it. Shall share with them! This is a great recipe. I will be trying the bbq sauce. What is the shelf life like? Since it has a lot of sugar but no preservatives, I tend to only keep it for 2-3 days. It’s normally eaten by then, though, so long-term storage has been less of a concern for me. It seems to freeze with minimal changes, so I would recommend freezing extra portions if you know you want them for later. Mmmm this made me hungry! I did try to make BBQ sauce once and agree its more difficult than you would think. Thanks for the recipe! Hi, Courtney! This recipe does have a lot of ingredients, but it’s really easy to make! I encourage you to try it for sure! Yum! I do love my ribs, so I’ll have to try these out. The sauce sounds amazing. It’s nice to read about making the BBQ sauce.I always use store bought sauces,But this sounds a great way to try! Thanks, Amila! I like knowing exactly what is in my sauces. Plus this BBQ sauce is so quick to make, it’s no trouble to cut out all those preservatives and additives. The ribs look delicious and I bet they are quite yummy, too. I am not familiar with the concept of FODMAP. Have you written an introductory blog post that I can read? These ribs are to die for! I tested the recipe on some of my non-FODMAP friends and they agreed the recipe was a smash! I would highly recommend you try it, especially if your partner are into BBQ. Hi, Chandresh! I would highly recommend you share this recipe with your friend! It’s easy to make and it tastes delicious! This is very detailed and great post. I am so happy you enjoyed and would be happy to share this with my ribs lovers friends. That’s awesome, Jana! Make sure to send them back here to tell us how the recipe worked out for them. Let me know what you think of the recipe when you try it! Don’t forget to send me a photo on Instagram. Use the hashtag #fodmapformula so I can see your yummy creation! Great post those ribs look amazing. I was dx with IBS in 2008 and last year was dx was changed to Crohns disease. I was on this diet for a little while, but it changed after I had surgery. Thanks for sharing. Sorry to hear about your change in diagnosis. The Low FODMAP Diet has also been tested with some promising results for patients with IBD (Monash: http://fodmapmonash.blogspot.ca/2016/04/research-update-long-term-improvement.html) If you ever need the Low FODMAP Diet again, don’t forget about us! Ooh, so delish. Thanks for sharing such an amazing recipe with us! Glad you like the recipe. Don’t forget to come back and let me know how you liked it if you try it. Glad to hear you’re excited about this BBQ rib recipe. IBS sits very differently in each of our bodies, so some foods aren’t right for everyone, even if the servings are low FODMAP. You can check out lots of other side dishes in my recipe section.